Porella platyphylla is a fairly common liverwort in our area and one of my favorites. It is also the only terrestrial member of the genus in central New York. 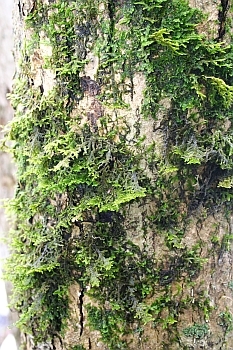 Liverworts were once thought to be members of the division "Bryophyta", along with hornworts and mosses. Modern studies, however, place them in their own division "Marchantiophyta", with mosses ("Bryophyta"), hornworts ("Anthocerotophyta") and all vascular plants ("Polysporangiates") making up the other three. I found many references that consider P. platyphylloidea to be a separate species but Therien, et al. (4) concluded that the two species cannot reliably be distinguished so the older name takes precedence. Grout(3) assigned Porella to the family "Jungermanniaceae - The Scale Mosses" but today they belong to the family Porellaceae (in the order Jungermannieales), of which the genus Porella comprises by far the largest genera. 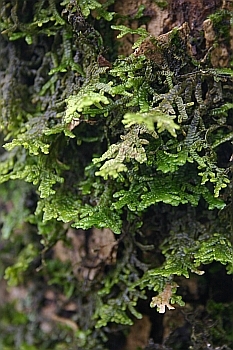 Liverworts are small, green plants that lack well-developed vascularization. They are green because, like most larger herbacious plants, they manufacture chlorophyll. They are small because they are gametophytes; that is, the sexual, dominant phase of a two-part lifestyle known as "Alternation of Generations". When a sperm from a liverwort male structure (antheridium) fuses with an egg cell located in a female structure (archegonium), the egg develops into a zygote. The zygote, in turn, develops into a structure that is different in form and function from the gametophyte. This new structure is called the sporophyte and it represents the other half of the lifestyle. In this phase spores are formed and each spore, under suitable conditions, can germinate and grow into a new gametophyte. Liverworts can also reproduce asexually, however, when pieces of the plant or specialized propagules break off and develop into new plants. They, along with mosses and hornworts, are all found in our area although the hornworts are few in genera and more difficult to find. The taxonomic class name of liverworts is Hepaticae, a term derived from the liver-like (hepatic) shape of the leaf. I often see Porella platyphylla in our forests and it always catches my attention. Although sometimes found on rocks, I usually see it growing on tree trunks. Radula spp. and Frulania spp., two of our other common liverworts, are associates(5), often found growing nearby. Porella platyphylla is a dull yellow-green color and its presence is welcome in winter where it stands out against a dark tree trunk and snowy forest floor. It literally does "stand out," for its pinnately branched stems form prostrate tiers that protrude away from the tree (see photo). Each individual stem consists of overlapping lobes and each leafy shoot is 2 to 4mm wide. The next time you are "out'n'about" in your favorite woods, look for this interesting plant. Its distinct morphology makes it a good and easy find for learning about our liverworts. Conrad, Henry S., and Redfern, P. L. Jr., How to Know the Mosses and Liverworts, McGraw-Hill, 1979. Hicks, Marie L., Guide to the Liverworts of North Carolina, Duke University Press, 1992. Grout, A. J., Mosses with a Hand-Lens, Published by the author, Third Ed. 1924. Therrien, James P. et al.,"Morphological and Genetic Variation in Porella platyphylla and P. platyphylloidea and Their Systematic Implications",The Bryologist, Vol. 101, No. 1 (Spring, 1998), pp. 1-19. Schuster, R. M., Boreal Hepaticae, a Manual of the Liverworts of Minnesota and Adjacent Regions, Lubrecht & Cramer Ltd (1977).